Focus E15 campaign sends condolences to everyone affected by those who died in the fire at Grenfell Tower and offers our solidarity and support to the residents. We will continue to fight alongside you in the struggle for decent long-term secure safe housing for all. Follow Grenfell Action Group, Focus E15 campaign, Radical Housing Network and others for details of coming events, meetings and actions. We reprint below the press statement by Radical Housing Network and urge readers to look at the blog pieces of the Grenfell Action Group, who for years have campaigned and written about the criminal inadequacies of the Royal Borough of Kensington and Chelsea (RBKC) and the estate landlord Kensington and Chelsea Tenants Management Organisation (KCTMO). ‘Managed decline’ of council housing and contempt for tenants contributed to fire. The catastrophe at Grenfell Tower was foreseen by a community group on the estate. Just 7 months ago, Grenfell Action Group, a member of Radical Housing Network, warned that failings in the estate management organisation’s health and safety practices and attitude were a “recipe for a future major disaster”. These warnings were dismissed by Royal Borough of Kensington & Chelsea (RBKC) council. Radical Housing Network called the fire a horrendous example of the consequences of a combination of government cuts, local authority mismanagement, and sheer contempt for council tenants and the homes they live in – and an indictment of London’s housing inequality. “This Government, and many before it, have neglected council housing, and disregarded its tenants as if they were second class. Nationally and locally, politicians have subjected public housing to decades of systematic disinvestment – leaving properties in a state of disrepair, and open to privatisation. Regeneration, when it has come, has been for the benefit of developers and buy-to-let landlords, who profit from the new luxury flats built in place of affordable homes. Across London, regeneration has meant evictions, poor quality building work, and has given tenants little meaningful influence over the future of their estates. Congratulations to the ‘Balcony 4’ and Focus E15 campaigners who successfully dropped banners from a disused, sold off and boarded-up police station in East Ham on Sunday 10 July 2016, to highlight the current crisis in housing. This action took place during the Mayor’s Newham Show (will he call it the Robin Wales Show next year?!) – which is a two day council-sponsored event that takes place in a local park in East Ham. Focus E15 campaign was determined to let people know what is really happening in the Labour controlled borough of Newham where Mayor Robin Wales is still at the helm. As the Mayor’s show took place, this action unfolded. The background story is that the campaign has protested during the mayor’s show over the last two years. In 2014, Robin Wales over-reacted to young mothers talking about rights to housing during the show and a complaint was lodged against him. He faced the Newham Standards Committee and was found guilty of a breach of the code of conduct (watch from 1.45: http://youtu.be/gsPxancNiqk). Then in 2015, the council ordered private security to stop campaigners handing out leaflets during the Mayor’s show and had campaigners forcibly removed from the park in a heavy handed manner. (http://youtu.be/SpbnD9RzuQ0). Whilst Robin Wales and his entourage were swanning around the park, the reality for thousands of people living in Newham is increased insecurity: rents are always rising, council homes are being sold off and more people are living in overcrowded, appalling temporary accommodation. 35% of Newham residents earn below the London Living Wage, yet the mayor has a salary of £80,000 and last year the same amount again was spent on his expenses. Hundreds of messages of support for the temporary occupation of the police station’s balconies came flooding into the campaign. The Balcony 4 came down at end of the protest to applause and loud cheers from everyone on the ground. Focus E15 campaign would like to say a big thank you to all those who supported this action, with your presence, your cameras and your voices, and to the speakers from East End Sisters Uncut, Revolutionary Communist Group, Feminist Library, Boleyn Dev 100, Tower Hamlets Renters and Newham Green Party. Another successful action, working together and challenging Newham Labour Council! The campaign would also like to send our solidarity and congratulations to East End Sisters Uncut for their current occupation of empty council homes in Hackney as they highlight the cuts to services for domestic violence and the closure of refuges. Please support their occupation over the coming days and weeks. Join the campaign on Sunday July 10 at Newham Town Hall, Barking Road, East Ham from 3pm onwards. Newham has the most empty properties out of any London borough, around 1,318 properties are lying empty – the total value of these empty properties stands at almost £470m. In 2015, 244 families from Newham were permanently sent out of London, with Newham Council citing that there was no space or money to house them in the borough. If these issues matter to you, come and join out street stall outside East Ham town hall. If you have not been to the street stall before, just come and say hello if you are passing to go to the Newham Show. Join the campaign to demand that the empty properties in Newham are opened up to those who need them most. Put human being first! Stop sending people out of London.Decent homes for everyone! Join the special street stall this Sunday and make your voices heard with Focus E15 campaign. On Monday 27th June 2016, Boundary House residents went to Waltham Forest council’s housing office, Cedar House, to fight back against the appalling conditions they have been forced to live in. Boundary House is a block of one-bedroom flats of ‘temporary accommodation’ in Welwyn Garden City which is outside London. From there it is a long and expensive commute back to Walthamstow where most of its current residents are from. The distance and cost means that residents are isolated from their family, friends and support networks, with one mother of two being forced to quit her job in London, as she could no longer afford the commute. The conditions there are terrible, with mould, cockroaches, overcrowding and dangerous faulty appliances. One resident, pregnant and living with her young daughter, had to survive the winter with no heating. Still today, their heating has not been fixed. On the third floor of Boundary house there is a young mother living with her now four month old baby, who was delivered by C-section. As there are no lifts in the block of flats, and the block is not safe or secure enough to leave the pushchair down stairs, every time this mother wants to go out she must carry her baby in the pushchair up and down three flights of stairs. The strain of this has meant that she has not been able to fully heal from the operation. Boundary House was not built with families in mind. Nonetheless, Waltham Forest council have been sending their constituents to this accommodation and have done nothing to ensure the properties are fit for purpose. When Boundary House residents tried to raise these issues to Waltham Forest council, they have received little, if any, responses to their letters, phone calls and emails. This is why on Monday 27th of June, Boundary House residents decided enough if enough. Supported by Focus E15, and others, we marched on the housing office, as a united community to demand to speak to someone who could act upon our demands. When we arrived, security tried to refuse us entrance into the office. But we did not stand for it and insisted to be let it. Once the security had conceded to our demands to enter, we were told the Director of housing would not be able meet us. We refused to accept this and told them we would not move until Boundary House residents were able to speak to someone in charge. It did not take long for the council to concede, and we won a group meeting with the Director of Housing for Waltham Forest Council, whom some Boundary House residents have been trying to get in contact with for over two years. We were taken to a conference room, and every resident had the chance to tell their story, express their concerns, fears and frustrations, and to demand the Waltham Forest Council treat its residents with respect and dignity. In the meeting, the Director of Housing agreed to listen to our demands, to investigate the appalling conditions of Boundary House, and to hold another meeting in the coming weeks to update Boundary House residents as to what actions they have taken improve from the current conditions. This is a small victory of Boundary House Residents. The action has demonstrated that when we fight together, they cannot ignore us! We will continue to fight, to make sure that Waltham Forest council holds true to their words, and we will continue to demand that Waltham Forest council bring Boundary House residents back to London. Joins us on our street stall in Stratford outside Wilkos on the Broadway on Saturday from 12pm. March Against the Housing Bill! (there will be no Stratford stall outside Wilko’s). Travel to the start together… meet Focus E15 at Stratford station at 11am (outside the exit that leads onto the bus station, near the train statue). The march, organised by Lambeth Housing Activists, starts from the Imperial War Museum, Lambeth Road, SE1 6HZ (nearest tube Lambeth North) and will march to Downing Street for 2pm. See below re other events and actions related to opposing the Housing Bill. Congratulations to FYSA theatre company for the latest E15 performances. Reviewed below and more performances scheduled for later this year. Focus E15 campaign stall 12-2pm on the Broadway outside Wilkos in Stratford. We will be supporting the Radical Housing Network’s call for action against the housing bill. Come and speak out, leaflet and use the open mic. Make plans, talk to people on the streets to make the housing movement grow. All welcome. Take part in East London Radical Assembly’s stall crawl and get involved with the housing movement in your area. Discussion in particular about the Immigration Bill and the impact on housing and planning future events. Big Thank you to Simon from Architects for Social Housing who spoke about the housing bill at the last meeting. 26 January: 2nd Reading of the Bill in the House of Lords (first chance to discuss areas where amendments are needed, so start lobbying Lords before this date). Defend Council Housing lobbying Southwark Council offices at 160 Tooley Street (6.00pm). 30 January: March Against The Housing Bill, called by Lambeth Housing Activists (midday), from Imperial War Museum to Downing Street. 2 February: Defend Council Housing Protest outside Parliament (4.00pm), followed by testimony meeting (5.00-7.00pm), in Committee Room 4a. 6 February: Defend Council Housing organising meeting (11-1pm), Unite the Union, 128 Theobald’s Road. 9 February: Islington Hands Off Our Public Services Commission, public meeting on the Bill (7pm), Islington Town Hall, Upper Street. 10 February: Estimated date of Committee Stage of Bill in House of Lords. Detailed examination of the Bill lasting around two weeks. 13-14 February: We Love Council Housing, weekend of actions against the Bill called by the Radical Housing Network for the Valentine weekend. 24 February: Estimated date of the Report Stage of the Bill, when the House debates any committee amendments. This is shortly (that day or the following week) followed by the Third Reading, the last chance for the House to vote on amendments. Any amendments are then sent back to the Commons for consideration. Then the Bill is sent for Royal Assent. 13 March: Kill the Housing Bill (Act) / Call for Rent Control, National Demonstration called by Defend Council Housing. 16 April: People’s Assembly Against Austerity: March for Health, Homes, Jobs and Education, Central London. 5 May: Elections for London Mayor. The Housing Bill, civil disobedience and the mothers of Argentina. With the imminent implementation of the Housing Bill, Focus E15 Campaign has been reviewing and asking what this legislation means for the growing housing movement. What is clear from the hours spent at our weekly street stall in East London is that a lot of people do not know what this bill is about. This should not come as a great shock because our experience with key housing information is that the media, local councils and the government cover up the realities of this manufactured crisis in housing -after all to be educated is to be free, right? If the public truly knew and recognised the amount of homes lying empty in their street, borough and country, how long would the propaganda about the need to build more homes, but not being able to due to austerity, really stand up? The question is how does the housing movement move forward with a deliberately uninformed public as the most draconian housing legislation in recent British history gets pushed through parliament? Of course our job is to inform people, but what else can we do to convince people to take the action that is needed to repel this bill, boost the housing movement and put the working class on the front foot in the historical fight for suitable housing? We need civil disobedience and a refusal to cooperate with this daylight robbery. We need those forced with massive council rent hikes to refuse to pay them, to be prepared to stand in front of the state in the courts, and to win. Focus E15 campaign will be on the March Against the Housing Bill on the 30th January. This will not be a march which will stop the Housing Bill. People are not yet coming out onto the streets in great numbers. However, let this be a march to show people that when the reality of the housing bill drops through their letter box, their best chance is to join the housing activists they glanced at in the newspaper and in their news feed, because there will be people who are ready to fight with them. After all, this was in essence how our campaign began. Recently at our bimonthly campaign meeting, we had an excellent presentation about a study looking at the similarities between our campaign and the Mothers of the Plaza de Mayo (the mothers of the disappeared children in the 70s and 80s in Argentina). We heard that mothers first challenged the ‘problem’ – by writing letters, complaining to MPs and local representatives and it was when this process failed that the mothers, in both campaigns, became politicised. Also, significantly, in both struggles there were political activists and others working in the campaign from the start, (some affected by the issues directly, some not) who were ready to give their support -which in turn gave political confidence to the mothers. This helped to give these campaigns their weight, strength and longevity – the Argentinian mothers continue to fight to this day. Those that attend the march on the 30th January should be this political weight in the coming period. When the ‘solutions’ the working class are offered fail – then we can be sure 2016 will be the year of unrest the housing movement needs. The Housing and Planning Bill 2015 will put an end to the possibility of decent housing for all; it will see the end of council housing and social housing, while encouraging an unregulated corrupt private rental sector.More and more people will be forced into overcrowded, damp, unsafe housing, taking Britain back to the conditions of over 70 years ago, before the modern welfare state was developed. We must get together and fight for the right to decent, affordable, secure housing. Join the Focus E15 campaign on the march to Kill the Housing Bill which is being called for by Lambeth Housing Activists on Saturday January 30th. March to Cameron’s publicly funded home in Downing Street for 2pm. CALL OUT: STAND WITH NAZRAH AND ISMAIL! NO PROPERTY DEVELOPERS IN NEWHAM COUNCIL! On Friday, Nazrah and Ismail, two of the most active members of the Focus E15 campaign, will be facing Newham Council at the Royal Courts of Justice in Central London, and they need your support in the courtroom. 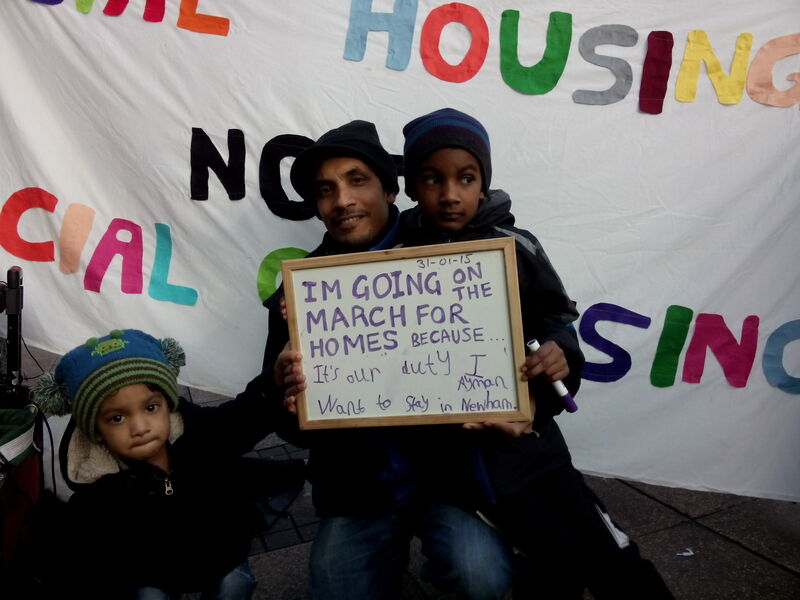 Since coming to a Saturday campaign stall in November 2014, looking for help resisting their family’s eviction, Nazrah and Ismail have worked tirelessly to support other families in Newham and beyond going through housing struggles of their own. They have lived in Newham for over 6 years and developed strong ties and support networks in the borough. In that time, with their three young boys, the family have experienced their own high court bailiff eviction and been in constant conflict with Newham Council and the Home Office about their housing, right to work (as a teacher and teaching assistant, respectively) and Asylum claims. On Friday they will be appealing Newham Council’s rejection of their responsibility to house the family, while challenging the role of a senior housing manager at Newham, who is also a board member of a property developer in the borough. The family are arguing that someone who makes a profit from property development, management and rentals, should not be in a position to determine the borough’s housing needs, or decide where families in need should be housed. Join them in the courtroom on Friday to help keep the pressure on Newham Council! Stand with Nazrah and Ismail! No to property developers in Newham Council! East London Night of Resistance says everyone needs a home! Join us. On Wednesday 28 October, join Focus E15 campaign at the King Edward VII pub on the Broadway in Stratford, London E15 for East London Night of Resistance, co-hosted with East London Fight Racism! Fight Imperialism and East London Radical Assembly. At the end of the night, we will be going to Stratford Mall to give support to the homeless people of Stratford who seek warmth and shelter and who are increasingly being moved on by police and security, as gentrification and social cleansing take hold of post-Olympic Stratford. Bring sleeping bags, thermos flasks and solidarity. While the Carpenters Estate in Stratford has over 400 empty council homes, homelessness is on the increase. As if this scandal wasn’t bad enough, Newham is amongst the 15 least affordable areas for private renting in the country and has one of the worst records in London for rehousing people out of the borough. Last year it moved 423 homeless families out of London altogether. Join us in the pub from 8pm and then on the streets to help build the resistance. Focus E15 campaign will be showing a short film called Squatters which is about housing issues in London in the 1970s. Pilar Lopez will be bringing folk music from Spanish freedom fighters. See pilarawa.wordpress.com for more information. Porcupine Dilemma will be playing a few acoustic numbers. We will be asking for donations to cover the cost of this event. A march against evictions awoke the heart of Stratford in the East End of London last Saturday when local people, political groups and campaigns took to the streets to demand decent housing for all. The march was militant, diverse and empowering, full of noise, speeches and lively chants. It was led by the original Focus E15 mothers and their families plus others who face being shoved out of London due to a manufactured housing crisis. A local mother, Bianca Ford who is being evicted with her children on October 12 in Redbridge said she had never been on a march before but marching with others who care about housing issues had given her the confidence to speak out. Afterwards she said that the march had been a ‘real buzz’. Residents from the Focus E15 hostel were also uplifted by the gathering of people and felt like they could speak out about their current housing fears. This shows that our active solidarity brings courage to people, inspiring them to take action. Ghassem from Asylum Clinic spoke about migrants, refugees and asylum seekers and the racism and discrimination they face in housing. Class War stormed into Foxtons letting agency, drawing attention to rip off house prices, agency fees and high rents. They were congratulated for taking this action by many on the march. People also became angry and vocal when we passed by Bridge House, Newham’s homelessness housing office: a homemade banner was hung over the entrance demanding Newham Labour council stop social cleansing. Squatters rights were also championed and Sisters Uncut made the links between housing security and the importance of fighting against domestic violence. The march finished up on the Carpenters estate because 3 tower blocks on the estate are still virtually empty. 400 flats have been left to rot by Newham labour party in the middle of one of the worst housing crisis this country has seen in a long time and one that continues to affect the most vulnerable people in our communities. Both Sam and Jasmin from the campaign spoke about the actions the campaign has taken to place the housing crisis on the political agenda in Newham and beyond. They then untied 100s of balloons which symbolized the 50,000 people who have been forced to move out of borough (in London) during the past 3 years.